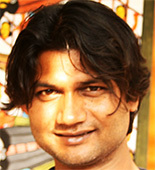 Born in 1980, Anwar Chitrakar has been practising his art for over 20 years. Beginning as a traditional patua artist in the 19th century Kalighat style, depicting baboos and their bibis, he gradually evolved as a more individualistic painter. When the demand for Patua paintings waned in the 1990s, because of the rise of cable television and other kinds of entertainment, Anwar almost gave up on his art. But in 1998 he took it up again and went on to earn accolades for himself. He has participated in many group exhibitions in India and abroad, including the Berlin Festival in April 2012 and the Namaste India Festival in Japan in October 2012. He won the State Award (West Bengal) in 2002 and the National Award in 2006 and the Rabindra Bharti University Award for his innovations in Patua painting. He was commissioned by the Government of India in 2013 to make a painting of Goddess Durga for the Mumbai International Airport. His work on Kalighat Patachitra paintings has been showcased at Kolkata’s Victoria Memorial and London`s Victoria & Albert Museum. His works have been collected by many art collectors in India and in countries like Germany, UK, France and USA. "Two things stand out in Anwar Chitrakar’s work. The first is that, even though he calls himself a patua, and the iconography in his work draws distinctly from the patachitra universe, he borrows from other traditions like mithila painting in order to, perhaps, underline his difference from other artists, and imbue his work with layers of meaning. The second aspect that stands out in his work is his signature - since the designs and songs in patachitra are communally owned, an artist signing his/her work is very rare. He rarely paints long scrolls like his forefathers, and doesn’t care so much about the patachitra songs. Anwar is an example of the ‘artist as an individual’ in a community-based practice. But that, he feels, does not make him any less a patua. “I am someone who is from within the tradition; my family is a family of patuas,” he says by way of explanation. This legitimisation of his practice as a patachitra artist is what gives him purchase in the art market. Without it, he would be just another artist borrowing from and experimenting with painting styles. Most of his work draws on mythological themes. "